Manchester City’s Sergio Aguero out of favour ahead of Crystal Palace tie in Gameweek 34, but why? Just five Gameweeks remain of the 2018-19 Fantasy Premier League season, and those small tweaks here and there can make all the difference. So, what to do FPL bosses? Stick or twist with some of your most loyal servants ahead of the upcoming Double Gameweek? Many FPL bosses are twisting ahead of Gameweek 34, with two BIG assets being disposed in large numbers, despite both being in good form of late. It’s a tricky one! As always, we try and get into the minds of the masses and discover the thinking behind the biggest transfer moves so far this week, and hopefully offer some reasonable logic as to why folk are buying and ditching ahead of Friday’s 7pm (BST) deadline. It’s a double Gameweek for Brighton, and this has catapulted Shane Duffy to the top of the Defender shopping list for over 195,000 FPL bosses ahead of Double Gameweek 34. The Seagulls have back-to-back home fixtures – beginning the Gameweek by welcoming Eddie Howe’s Bournemouth, followed by the visit of fellow strugglers Cardiff City. Chris Hughton’s side have managed just two clean sheets in their last 11 league games, but with two bites of the cherry on home soil, FPL bosses appear optimistic that the Irish defender can bring in some extra points on the cheap, at a cost of just £4.7m. This is one of those late-season gambles that could make all the difference – a risk worth taking if you’re playing catch-up. Many FPL bosses are pinning their hopes on Spurs ahead of their Gameweek 34 clash with Huddersfield at the new White Hart Lane. With Harry Kane likely to miss the remainder of the season through injury, the weight of expectation is on the shoulders of Son once again. The South Korean usually comes up trumps in the absence of Kane, and he’s well placed to do so again here against the already relegated Terriers. The former Leverkusen forward ended his run of six league games without a goal by scoring the opener in their win over Palace last time out, and this looks like the ideal fixture to build on that positive start to life in their new stadium. The sports betting football markets at this URL have Heung-Min Son as the 2nd favourite Anytime and First Goalscorer, which is encouraging new for Fantasy Premier League managers this weekend. Even at £8.6m, he’s a must own this time around, and over 325,000 Fantasy Premier League bosses agree ahead of Double Gameweek 34 – making him the most transferred in player so far this week. Despite producing one of the standout individual performances of the season in Gameweek 33, Eden Hazard is currently the most transferred out player ahead of Chelsea’s trip to Liverpool in Gameweek 34. If the Belgian is to pick up where he left off, he’ll have to breach the Premier League’s meanest defence. Liverpool have conceded just 10 goals on home soil all season, but Hazard is most certainly the man for the big occasion, and he’s been a thorn in the side of the Reds on several occasions in the past. What’s more, with the race for the top four still very much on, Chelsea have it all to play for, and will look to pounce on what is likely to be a nervy Anfield atmosphere. With that in mind, I won’t be adding to the 165,000+ FPL bosses who’ve opted to shop elsewhere ahead of Gameweek 34. The goals have dried up slightly for Sergio Aguero of late, having scored just one in four following a blistering run of form prior to that. Even so, City’s top marksman is most definitely dividing opinion across the FPL Commuity ahead of Gameweek 34, as he’s currently the fourth most transferred out player this week – but strangely, the decision to transfer him in is proving equally as popular at the time of writing. So, what’s the thinking here FPL bosses? Firstly, the injury to Harry Kane in the Champions League has almost certainly helped turn the tide, with many opting for a straight swap. Secondly, there seems to be a fairly widely-held belief that the Champions will find the going tough when they visit Selhurst Park in Gameweek 34. But why? Man City have failed to win either of their last two meetings against Palace, who claimed a shock 3-2 victory at the Etihad back in December 2018. That said, the Eagles have the worst home record of any of the sides currently outside the bottom three, and so the idea that Selhurst Park is a fortress is, frankly, a bit of a myth, in my opinion. For me, Sergio Aguero remains a priceless asset well worth owning ahead of Gameweek 34 – particularly in Kane’s absence. 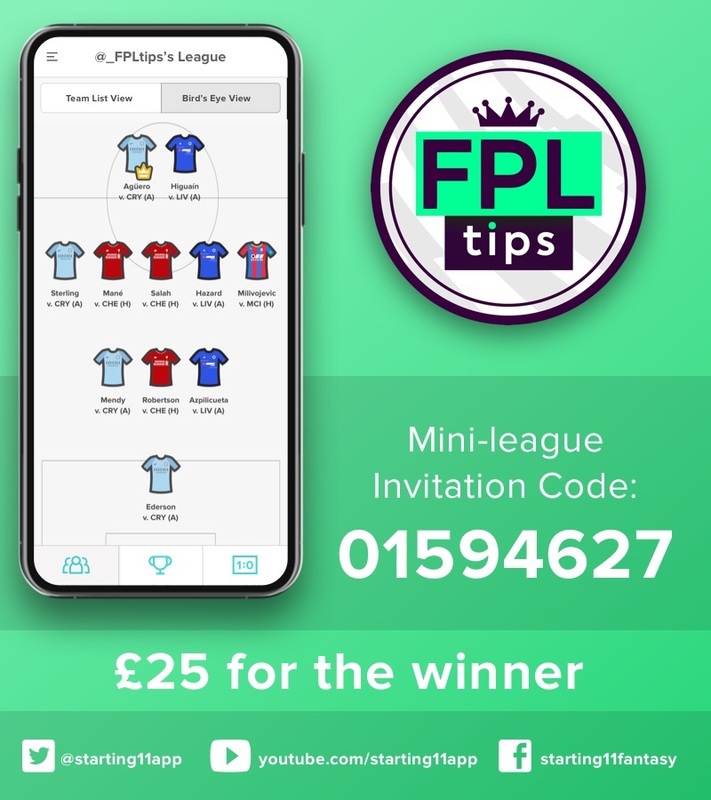 BEFORE YOU GO… We’ll be giving away £25.00 in cash to the winner of FPLTips’ SUNDAY Mini League on Starting 11 this week. Simply download the free app below and create your best 11-man team for SUNDAY’S 2 Premier League games, which kicks off at 2:05pm BST – oh, and you’ll need to pick a captain.